Taylor is a rescue dog who was under the care of the non-profit Whistler Animals Galore Society (WAG). WAG referred Taylor to us when they noticed that he appeared to be in distress and had a very distended belly. Dr. Margiocco ultimately diagnosed Taylor with a rare heart defect that was causing blood to pool in his abdomen. 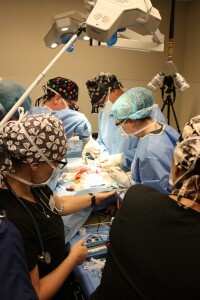 After less-invasive treatment options proved unsuccessful, it was determined that open-heart surgery was the only viable option to save Taylor’s life. However, Taylor had a good prognosis for a long full life without the need for ongoing medication or treatment if the surgery was successful. 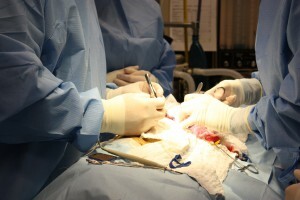 In addition to the planning involved prior to surgery, there were many hours of preparations required by the full team on the day of surgery. However, the actual procedure itself needed to be completed in under two minutes, or the loss of blood flow to other areas of the body would prove fatal. Dr. King successfully completed the procedure in 1 minute 40 seconds. 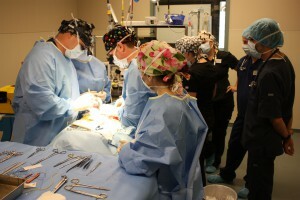 Canine open-heart surgery is an extremely complex procedure and in Taylor’s case it involved several weeks of advanced planning, including consultations with cardiologist Dr. Christophor Orton of Colorado State University’s College of Veterinary Medicine & Biomedical Sciences, who had prior experience with this type of procedure, and we wish to publicly extend our thanks here to Dr. Orton for his invaluable assistance. 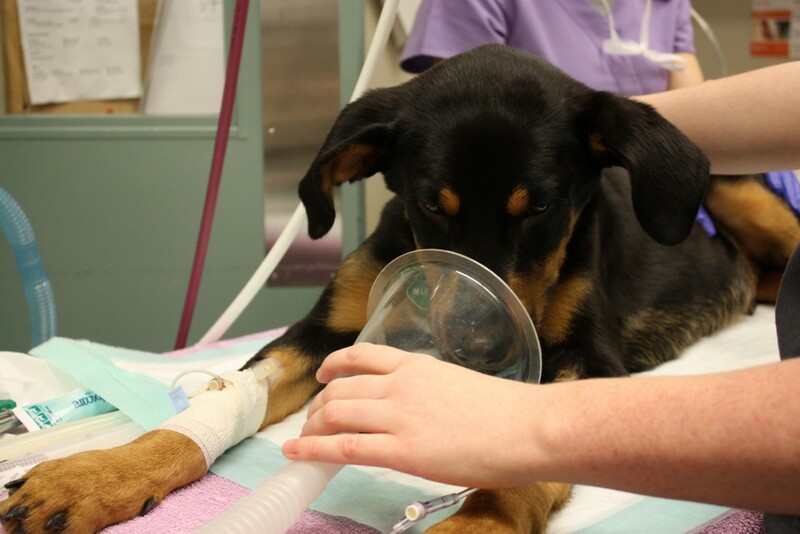 In addition to the time on this case donated by our in-house team, a significant portion of Taylor’s treatment costs was covered by a contribution from the Jessie + Bandit Animal Care Fund. 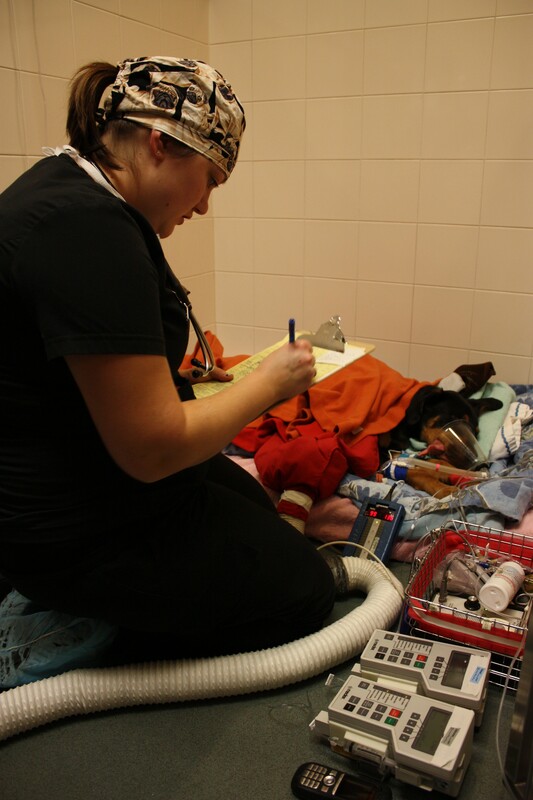 As a large veterinary specialist hospital, we regularly encounter animals with extremely complex medical problems whose treatment costs exceed their owner’s financial means. We also know first-hand that there are many people with a deep love of animals who want to support advanced medical care for pets in need. 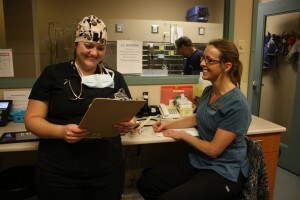 The Jessie + Bandit Fund was developed with help from a former Canada West client who wanted to help other pet owners in need, and is designed as a mechanism for pet owners to help other pet owners. The Jessie + Bandit helps financially support Canada West patients cover a portion of the financial costs involved in extraordinary cases. 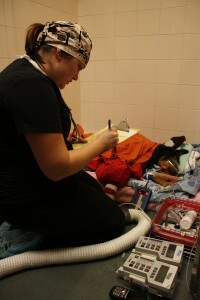 All money donated to the Jessie + Bandit Fund goes directly towards the care of animals being treated by Canada West where there are extraordinary expenses and/or the pet owners face financial hardship. You can learn more about the Jessie + Bandit Fund or make a donation by clicking the image below. Taylor was released from hospital on Friday, November 6 – only 3 days post-surgery! He’s doing extremely well and we expect him to live a long and happy life without need for extensive ongoing medication or treatment now that his heart is working properly. We are both proud of this accomplishment and humbled by the support we have received from both the public and the veterinary community in response to this case. It is a wonderful result and we hope you will join us in wishing Taylor and his new owner all the best in their new life together.